I am not a mathsmith. The upside of owning your own business is that you’re your own boss. And what that means is you own a business: yours. So, for the most part, your success or failure depends on the choices you make. Like right now. I would love to watch the season finale of Glee. Or, the Justin Timberlake-Lady GaGa Saturday Night Live from this weekend. But here I am writing a blog post for wordsmith. And that’s what I need to do rather than swoon over Blaine and the rest of the McKinley High Glee Club. This very grown up insight follows a very educational meeting with my accountant, wherein he reassured me that I am not failing miserably as an entrepreneur. Wordsmith is actually clicking along very, very well. What I found so interesting about the meeting was his sheer command of the tangled mess that is tax law and business finance. In these two areas, I freely admit I have zero expertise. None. And that’s why I got help from someone who knows this stuff. He patiently answers my many (some outright laughable) questions and at the same time gives me the Business 101 class I never took or tuned out. I’ve worked for twenty years, but there’s so much I’ve never had to think about before. You never realize how much there is to “working for yourself” than writing. Thankfully, there are smart people and smart software out there who can help with all that. So you can get on with the business of being successful at what you do. Or watch the Glee finale. It’s up to you. 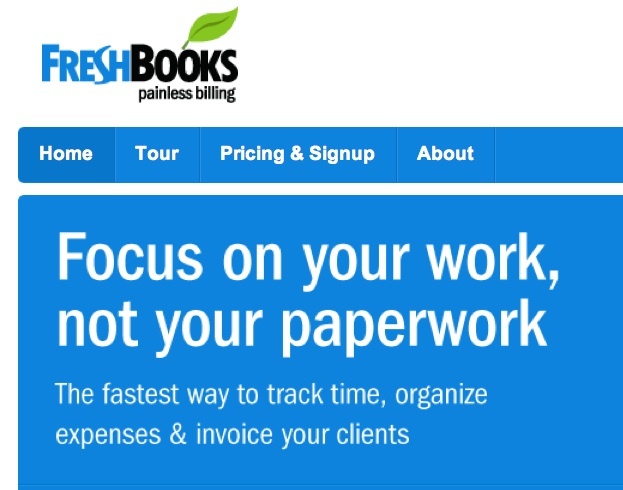 One of the items on my wordsmith to-do list last week was to look at FreshBooks. I’d seen the time tracking and invoicing program on a few other freelancer blogs so I made a note to check it out. Then I promptly threw myself into writing my first few projects and kept bumping my investigation down the list. Finally, I checked it out today and I am in love! FreshBooks is built on offering painless billing and it’s free for up to three clients! Within a matter of a few hours, I filled in my client profiles, added all of wordsmith’s current projects and the accrued time to date for each. Then, I e-mailed my first invoice. No swearing. No complaining. No three-step process using three different programs. FreshBooks makes billing and financials enjoyable even for a math-phobic person like me! John, who has a vested interest in wordsmith’s successful financial management, took a good-natured look at every “Ooo! Look at this!” and “Hey, check this out!” I’ve had in the account set up phase this afternoon. Even if you’re not in the market for invoicing and time management software, take a look at the FreshBooks website and blog. It’s fun, fresh and injects some well-placed laughs into the blah-blahs of getting paid for what you do!